Today I was able to get my hands on a new Linx 1010 thanks to Simon de Senlis Primary School. This is a 10″ tablet, which is the company’s second release. The first edition of the Linx 10 seemed like a great tablet with great specs. The thing that let it down was the origami keyboard design and the cheap feel of it’s case. So have they overcome this and made the Linx 1010 better than its predecessor? The first thing I noticed is the two full sized USB sockets on the tablet. This offers better connectivity than most tablets as quite a few will only come with one USB socket. 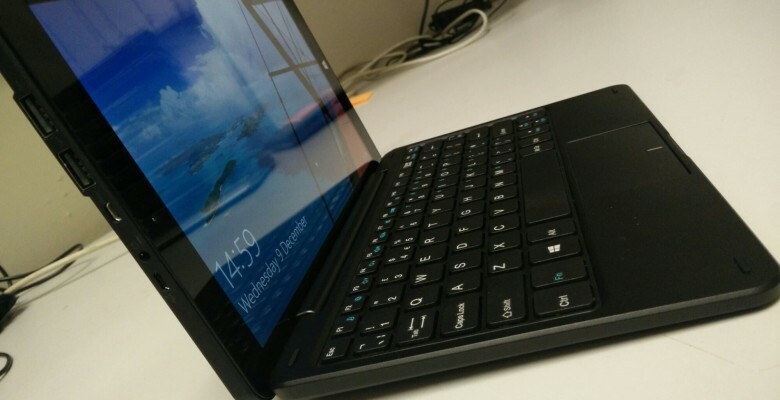 The tablet feels robust and the design of it has improved from the Linx 10. The Linx 1010 comes with Windows 10 Home edition pre-installed and boasts its Quad-Core Intel Atom processor and 2GB RAM, so the performance of the device is great for it’s price. The camera is still very under spec with it only being 2MP but it does have a front and rear-facing camera so you are able to take snaps while walking around with the device. Now for the deal breaker…. Is the keyboard any better? Straight away the keyboard feels 100 times better than the original origami version. Its a solid case with an adjustable dock so you can move the tablet to an angle that best suits you. The keys feel a lot better to type on and the mouse seems to actually work. It hasn’t got the same feel as a high-end tablet like a Surface Pro but for it’s price you wouldn’t expect that. The Linx 1010 states it’s battery life should last around 5-7 hours. I wasn’t able to test this today but I did have it running on battery for a good few hours and it didn’t drop below 50% charge. The tablet charges using a micro USB so it no longer uses a specific charger like the Linx 10 did. For the price I would say they are very good value for your money. They aren’t going to compete with the likes of the Surface Pro but they will definitely compete at the lower end of the market. The device has come a long way since the Linx 10 and it seems the company has listened to what people have said and improved their product.